Low Vitamin D Levels Associated With Increased Risk Of Colorectal Cancer : Shots - Health News The jury's been out on whether low blood levels of vitamin D increase the risk of colorectal cancer. Researchers say a new review involving more than 12,000 people strongly suggests the answer is yes. 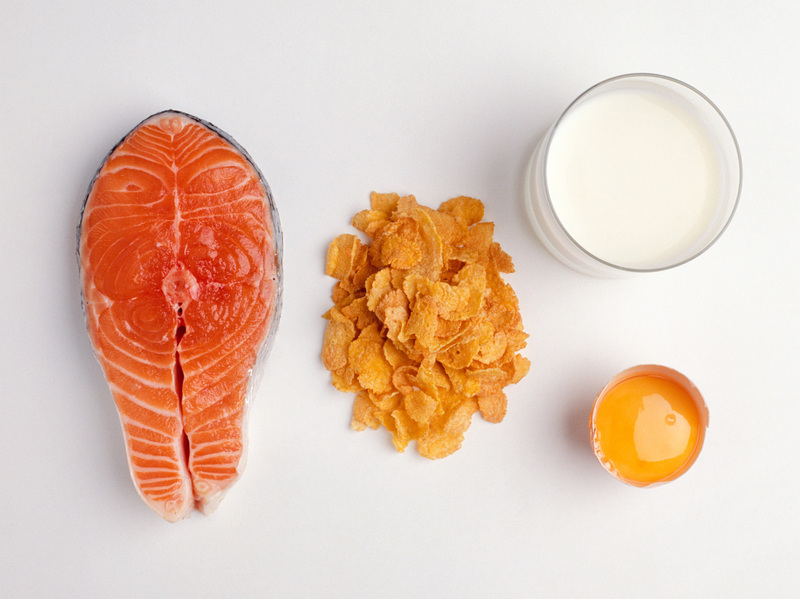 A serving of salmon contains about 600 IUs of vitamin D, researchers say, and a cup of fortified milk around 100. Cereals and juices are sometimes fortified, too. Check the labels, researchers say, and aim for 600 IUs daily, or 800 if you're older than 70. "For both men and women, deficient levels of vitamin D were associated with a 30 percent increased risk of colorectal cancer," says Marji McCullough, a nutritional epidemiologist with the American Cancer Society and study co-author. People who had higher circulating blood levels of vitamin D, above the range deemed "sufficient," had a 22 percent lower risk, she says. The study pooled findings from 17 previous studies that included 12,813 adults in the U.S., Europe and Asia. Those studies collectively looked at 5,706 people with colorectal cancer and 7,107 people of a similar age and race who didn't have cancer. Women's menopausal status was also taken into account. To determine what role vitamin D might be playing, researchers looked at participants' blood samples collected in the years before their cancer diagnosis. They also considered the established risk factors for colorectal cancer, including smoking, low physical activity and high body mass index. "Our findings suggest what's optimal for bone health may not be optimal for colorectal risk reduction," McCullough says, which could mean higher doses are needed to prevent cancer. Current recommendations for vitamin D supplementation are based solely on studies showing conclusively that it does preserve bone health. "We don't know why," she says. One hypothesis is that there is some interaction between vitamin D and female hormones. Or it's possible vitamin D prevents cancer by reducing the proliferation of tumor cells or by stopping their growth and "actually killing those cells," she says. Studies like this do not prove cause and effect but rather show only that there may be a connection between the levels of vitamin D circulating through the body and cancer. Still, the authors of the paper write that the results "substantially strengthen the evidence, previously considered inconclusive, for a causal relationship" between low vitamin D levels and colorectal cancer. Another interesting observation in the study, McCullough says, was that beyond a certain level, increasingly higher amounts of vitamin D in the blood had no additional benefit. At the highest levels above what is considered "adequate," there was no further reduction in risk. In other words, she says, "more is not necessarily better." Her take-home message: Don't race out and buy high doses of vitamin D "just in case." Overdoing it can be toxic. Taking too much vitamin D can cause kidney stones and, in very rare cases, death. The issue of whether vitamin D supplements should be used at all to prevent colorectal cancer is still up in the air. "The key question now is whether intervening with people who have low levels of vitamin D can make a difference," says Dr. Jeffrey Meyerhardt, director of the Gastrointestinal Cancer Center at Dana-Farber Cancer Institute in Boston, who was not involved in the study. The study didn't evaluate whether adding vitamin D through food, sunlight or supplements made a difference in cancer risk. It was limited to looking at the level of vitamin D in people's blood. Currently, a large study involving more than 25,000 patients is underway at Brigham and Women's Hospital in Boston to find out whether taking vitamin D supplements might reduce the risk of numerous cancers as well as heart disease and stroke. Meyerhardt says answers may be available in the coming year. In the meantime, he suggests people talk with their health care provider about having a blood test to measure vitamin D levels. If you're starting in the deficient range, he says, some doctors might prescribe high doses, to be taken each week for a month or two, and then prescribe lower, maintenance levels. The cancer society's McCullough says it is generally recommended that adults have a daily intake of 600 international units of vitamin D up to age 70. Men and women over age 70 should increase their uptake to 800 IUs daily, she says. "It depends on where you live and what race you are, because darker skin tends to absorb less vitamin D." Sun, age, genetics and weight also play a role in how the body processes vitamin D.
Vitamin D can be obtained from vitamin D-rich foods such as egg yolks, salmon, trout, swordfish, tuna and sardines. Numerous foods are fortified with vitamin D including cow's milk, almond milk, soy milk, some cereals and some orange juices. "If you have a serving of salmon, that's about 500 IUs, and a cup of milk would give you 100 IUs," McCullough says, which adds up to the daily recommended dose of 600 IUs. But Meyerhardt says most people don't eat enough fatty fish to reach the recommended vitamin D intake. "Most vitamin D doesn't really come from your diet" in most cases, he says. And he says multivitamins contain relatively low levels of vitamin D. "So you really have to take a supplement" to meet recommended doses. Vitamin D is often called the "sunshine" vitamin, because exposure to sunlight can stimulate production of the vitamin. But exposure to sun is generally not recommended as a way to boost vitamin D, McCullough says, since at excessive levels it can raise the risk of melanoma and other skin cancers.